Synthesis and investigation of SWCNTs and core/shell nanoparticles obtained by aerosol CVD method. Magnetic nanoparticles and carbon nanotubes as enhancers for targeted RNA delivery in vivo. Alexey P. Tsapenko, Anastasia E. Goldt, Eugene Shulga, Zakhar I. Popov, Konstantin I. Maslakov, Anton S. Anisimov, Pavel B. Sorokin, and Albert G. Nasibulin. Highly conductive and transparent films of haucl4-doped single-walled carbon nanotubes for flexible applications. Carbon, 130:448–457, 2018. Dustov Mavlavi, Diana I. Golovina, Alexander Yu Polyakov, Anastasia E. Goldt, Andrei A. Eliseev, Efim A. Kolesnikov, Irina V. Sukhorukova, Dmitry V. Shtansky, Grünert Wolfgang, and Anastasia V. Grigorieva. Silver eco-solvent ink for reactive printing of polychromatic sers and spr substrates. Sensors, 18(2):521, 2018. A. Martynova, A. E. Goldt, K.I. Maslakov, S.V. Savilov, A.V. Grirorieva. Electroplating of porous gold films for sers analysis of heme derivatives.Journal of Materials Science, 53(11):7953–7962, 2018. Polyakov A.Yu, Nesterov A.V., Goldt A.E., Zubyuk V., Dolgova T., Yadgarov L., Visic B., Fedyanin A.A., Tenne R., Goodilin E.A., “Optical properties of multilayer films of nanocomposites based on WS2 nanotubes decorated with gold nanoparticles”, Journal of Physics: Conference Series vol. 643, no.1, pp. 012046-1-012046-6, 2015. Belich N.A., Grigorieva A.V., Petukhov D.I., Sidorov A.V., Goldt A.E., Goodilin E.A., “Immobiliza-tion of Nanostructured Metal Silver at the Surface of Anodic Titanium Dioxide for the Creation of Composites with the Surface Plasmon Resonance”, Nanotechnologies in Russia, vol. 10, no. 5-6, pp. 345-352, 2015. D. Yaprynsev, A.E. 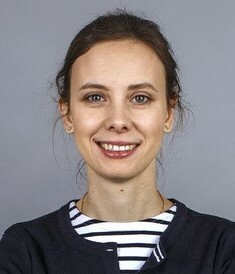 Baranchikov, L.S. Skogareva, A.E. Goldt, I.P. Stolyarov, O. Ivanova, V. Kozik, V. Ivanov. “High-yield microwave synthesis of layered Y2(OH)5NO3·xH2O materials”, CrystEngComm, vol. 17. pp. 2667–2674, 2015. Moskalenko E.A., Sadovnikov A.A., Baranchikov A.E., Goldt A.E., Kozik V.V. and Ivanov V.K., “Synthesis of nanocrystalline titania via microwave-assisted homogeneous hydrolysis under hydrothermal conditions”, Current Microwave Chemistry 1, no.2, pp. 81-86, 2014. Polyakov Alexander Yu, Lena Yadgarov, Ronit Popovitz-Biro, Lebedev Vasiliy A., Iddo Pinkas, Rita Rosentsveig, Yishay Feldman, Goldt Anastasia E., Eugeny Alexeevich Goodilin, Reshef Tenne, “Decoration of WS2 Nanotubes and Fullerene-Like MoS2 with Gold Nanoparticles”, Journal of Physical Chemistry C, vol.118, no. 4, pp. 2161-2169, 2014. Sorkina T.A., Polyakov A.Yu., Kulikova N.A., Goldt A.E., Philippova O.I., Aseeva A.A., Veligzhanin A.A., Zubavichus Y.V., Pankratov D.A., Goodilin E.A., Perminova I.V., “Nature-inspired soluble iron-rich humic compounds: new look at the structure and properties” Journal of Soils and Sediments,vol. 14, no. 2, pp. 261-268, 2014. Popov Andrey M., Labutin Timur A., Goldt Anastasia E., Usovich Olga V., Bozhenko Sergey E., Zorov Nikita B., “Determination of Lithium in Lithium-Ionic Conductors by Laser-Enhanced Ionization Spectrometry with Laser Ablation”, Journal of Analytical Atomic Spectrometry, Vol.29, no. 1, pp. 176-184, 2014. Nikiforov V.N., Gol’dt A.E., Gudilin E.A., Sredin V.G., Irkhin V.Yu, “Magnetic Properties of Maghemite Nanoparticles”, Bulletin of the Russian Academy of Sciences: Physics, vol.78, no. 10, pp. 1075-1080, 2014. Polyakov A.Yu., Sorkina T.A., Goldt A.E., Pankratov D.A., Perminova I.V., Goodilin E.A, “Mössbauer spectroscopy of frozen solutions as a stepwise control tool in preparation of biocompatible humic-stabilized feroxyhyte nanoparticles”, Hyperfine Interactions, vol.219, no.1-3, pp. 113-120, 2013. Polyakov, A. Goldt, T. Sorkina, I. Perminova, D. Pankratov, E. Goodilin, and Y. Tretyakov, “Constrained growth of anisotropic magnetic δ-FeOOH nanoparticles in the presence of humic substances”, CrystEngComm, vol. 14, no. 23, pp. 8097–8102, 2012. A. Semenova, E. A. Goodilin, N. A. Brazhe, V. K. Ivanov, A. E. Baranchikov, V. A. Lebedev, A. E. Goldt, O. V. Sosnovtseva, S. V. Savilov, A. V. Egorov, A. R. Brazhe, E. Y. Parshina, O. G. Luneva, G. V. Maksimov, and Y. D. Tretyakov, “Planar SERS nanostructures with stochastic silver ring morphology for biosensor chips”, Journal of Materials Chemistry, vol. 22, no. 47, pp. 24530–24544, 2012. Abakumov, A. Goldt, M. Sokolsky-Papkov, Y. Zorkina, V. Baklaushev, E. Goodilin, A. Kabanov, and V. Chekhonin, “Magnetic resonance imaging of endothelial cells with vectorized iron oxide nanoparticles”, Bulletin of Experimental Biology and Medicine, vol. 151, no. 6, pp. 726–730, 2011. Klimonsky S.O., Sheberstov K.F., Gol’dt A.E., Sinitskii A.S., Yakovlev V.Yu, Trefilova L.N. “Synthesis and properties of nanocrystalline CsI”, Inorganic Materials vol. 47, no. 9, pp. 1033-1038, 2011. Поляков А.Ю., Гольдт А.Е., Соркина Т.А., Давыдова Г.А., Гудилин Е.А., Перминова И.В, “Синтез биосовместимых магнитных наночастиц с различной морфологией и их стабилизация гуминовыми кислотами”, Перспективные материалы no.9 pp. 204-210, 2010. E. Chekanova, T. A. Sorkina, A. L. Dubov, V. N. Nikiforov, G. A. Davydova, I. I. Selezneva, E. A. Goodilin, L. A. Trusov, V. V. Korolev, I. M. Aref’ev, I. V. Perminova, and Y. D. Tretyakov, “New environmental nontoxic agents for the preparation of core-shell magnetic nanoparticles”, Mendeleev Communications, vol. 19, no. 2, pp. 72–74, 2009. E. Chekanova, A. L. Dubov, E. A. Goodilin, E. A. Eremina, A. Birkner, Y. V. Maximov, I. P. Suzdalev, V. N. Uvarov, A. D. Shevchenko, and Y. D. Tretyakov, “Soluble microcapsules for non-toxic magnetic fluids,” Mendeleev Communications, vol. 19, no. 1, pp. 4–6, 2009. Bayburtskiy, Y. V. Baldokhin, D. Korman, A. Chekanova, and O. Shlyakhtin, “Synthesis and investigation of magnetic properties of Gd-substituted Mn-Zn ferrite nanoparticles as a potential low curie temperature agent for magnetic fluid hyperthermia”, Journal of the Balkan Tribological Association, vol. 13, no. 2, pp. 223–228, 2007. И.П.Суздалев, Ю.В. Максимов, В.К. Имшенник, С.В. Новичихин, В.В. Матвеев, Е.А. Гудилин, А.Е. Чеканова, О.С. Петрова, Ю.Д. Третьяков “Оксиды железа в нанокластерном состоянии. Методы синтеза, структура и свойства”, Российские нанотехнологии, , т.2, № 5-6, с.73-84, 2007. Е.А. Еремина, А.Е. Чеканова, А.П. Казин, М.Н. Румянцева, П.Е. Казин, Ю.Д. Третьяков “Физико-химические свойства высокодисперного ZnFe2O4, полученного методом пиролиза аэрозоля раствора нитратов железа и цинка”, Неорг.Мат., т.43, №8, с. 956-962, 2007. Чеканова А.Е., А.Л. Дубов, Е.А. Гудилин, Е. А. Ерёмина, А.В. Кнотько, А.Г. Вересов, Д. Д. Зайцев, академик РАН Ю.Д.Третьяков “Иммобилизация магнитных наночастиц LiFe5O8 в водорастворимых микрокапсулах”, Альтер. Энергетика и Экология, т.8, №52, с.34-36, 2007. E. Chekanova, Y. Y. Philippov, E. A. Goodilin, O. S. Volkova, A. G. Veresov, Y. D. Tretyakov, E. A. Eremina, K. V. Klimov, A. N. Vasiliev, and Y. V. Syrov, “Application of nanostructured asp precursors for processing CaCuMn6O12 colossal magnetoresistance ceramics”, International Journal of Applied Ceramic Technology, vol. 3, no. 4, pp. 259–265, 2006. О.С. Петрова, Е. А. Гудилин, А.Е. Чеканова, А.В. Кнотько, Г.П. Муравьёва, Ю.В. Максимов, В.К. Имшенник, И.П. Суздалев, Ю.Д. Третьяков, “Получение мезопористых наночастиц g -Fe2O3 с использованием микроэмульсий”, ДАН, т.410, №5, с. 1-5, 2006. Volkova, E. Goodilin, A. Chekanova, A. Veresov, A. Knotko, A. Vasiliev, and Y. Tretyakov, “Magnetoresistive ‘necked-grain’ CaCuMn6O12 ceramics prepared by ultrasonic aerosol spray pyrolysi”, Mendeleev Communications, no. 4, pp. 131–133, 2005. Ерёмина Е.А., Хороненкова С.В., Чеканова А.Е. “Синтез манганита состава Nd7Ba0.3MnO3 с использованием микроволновой и механохимических обработок”, Вестн. Моск. Ун-та, сер.2. Химия, т. 45, №2, с. 107-111, 2004. Чеканова А.Е., Ерёмина Е.А., Ванецев А.С., Третьяков Ю.Д. “Микроволновой синтез манганита состава Nd7Ba0.3MnO3“, Неорг. Мат., т. 40. No. 5. с. 420-424, 2004. Preparation and investigation of magnetic nanoparticles (ferrites) for biomedical application (cancer treatment); Drug delivery using nanoparticles; Microprinting: рreparation of SERS substrates.